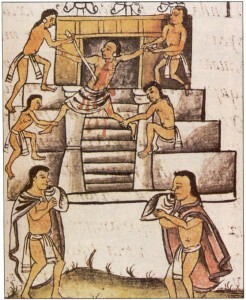 The Aztec frequently sacrificed humans to the gods. The people who were sacrificed, which mounting up to hundreds or even thousands per year, had their hearts ripped out and their skulls were stored in a neat rack called a “skull rack” which was maintained near the Grand Temple called “Templo Mayor”. In recent years, one such rack, probably the largest, has been discovered by the archaeologists at the site of the Great Temple in the key city of the Aztec Empire, Tenochtitlan. 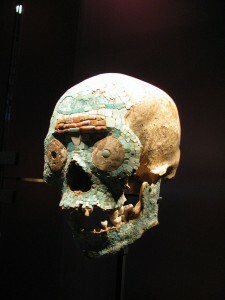 The rack used to store such skulls was called “tzompantli”. A fascination with human skulls and a propensity to store the skulls of sacrificed humans had existed in pre-Aztec culture such as that of the Toltecs, which existed from 9th to 13th century. Aztecs borrowed heavily from the earlier Toltec society in terms of art and culture, and the practiced storing skulls in racks also bears strong resemblance with a similar practice among the Toltecs. The Aztec skulls rack was called Tzompantli. In the Nahuatl language spoken by the Aztec, “tzom” meant hair or scalp while “pantli” is believed to mean row or wall. Tzonpantli, then, was a rack of skulls which comprised of two long vertical poles on either side of the rack. Between these poles, many horizontal poles were inserted and in each of these horizontal poles, human skulls were placed. The Aztec skull rack closely associated with the culture of Mesoamerican ball courts. Such ball courts were common throughout the various civilisations and areas of Mesoamerica. The ball court was a game which was played by two teams of players in a sizable court and had different significance for different cultures. It is believed that in many such cases, the losing team was sacrificed and their skulls put into the skull rack. Similarly, any captive warriors which were sacrificed to the gods also had their skulls placed in these racks. At one hand, these skull racks were a sort of tribute to Aztec gods and at on the other, they instilled fear in the hearts of any rivals who visited the city. Aztec sacrifice took place at the top of the temple. Typically, a priest would rip open the chest with a knife and take out the heart, which was presented to the gods. The corpse was pushed down the temple stairs and when it reached the bottom, its limbs were severed and it was beheaded so that the head could be stored in the rack. Some scholars have claimed that some of the limbs of the corpse were cannibalised by the warrior who presented the captive for sacrifice. Aztec skulls were stored in huge scaffolding-like racks. In one of these racks in the Tenochtitlan city of the Aztec Empire, a Spanish conquistador reported that 136,000 skulls had been stored. Other historic accounts reveal that 60,000 skulls were stored on the largest skull rack in Tenochtitlan. At one hand, these skull racks were said to be symbols of defeat and humiliation for the enemies of the Aztecs. At the other hand, they vindicated the Aztec gods and were a tribute to them. It has also been claimed that since many Aztec gods were represented by skulls, these skull racks were a way of invoking them. One of the major skull racks at the site of the Templo Mayor of Tenochtitlan city was discovered recently. The location of this discovery is consistent with the historical location of the temple. 35 skulls have been found at the excavation site so far, while further excavation is ongoing. According to the archaeologists involved in the excavation, this skull rack is the Great Tzompantli, or the great rack of the city of Tenochtitlan. The British Museum acquired a crystal skull in 1897 which was claimed to have been carved and created by the Aztecs and made up of a certain type of a quartz rock. Similar crystal skulls were circulated among other collectors of Europe during the same time. However, subsequent research into these skulls has revealed that they don’t have Aztec origins and were created much later than the days of the Aztec Empire and were rather forgeries created in the 19th and 20th centuries. 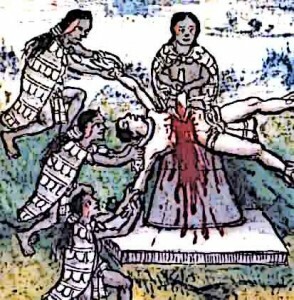 Aztec Sacrifice – The Aztec frequently sacrificed humans to the gods. Apart from the recent archaeological find of the Tzompantli at the site of the Templo Mayor in Mexican City, no Aztec skulls are known. In the 19th and 20th centuries, a number of crystal skulls started circulating in private and public collections. Many of these skulls were purported to be of Aztec origin. Most of these skulls were carved from a single piece of quartz and they ranged from crystal clear to smoky colour. However, over the years, all of these skulls have been definitively proved to be forgeries which cannot be traced back to the Mesoamerican culture. Rather, there is some proof that these skulls were carved in the 18th and 19th centuries where museums were eagerly seeking relics from the Mesoamerican cultures. Skulls had a great significance in the Aztec Empire. The Aztecs sacrificed captive warriors and any others that were ordained for the sacrifice. The hearts of these sacrificial victims were presented to the gods while the skulls were kept in huge racks in the capital city of the Aztec Empire, Tenochtitlan. The skulls served many purposes: they were a cause of shame and humiliation for their enemies, they were also an exclamation of the might of the Azteca and they vindicated the Mayan gods and were a kind of tribute to them. A number of such skull racks, called Tzompantli in the language of the Aztecs, were present in Tenochtitlan. The largest of these was at the Great Temple of the city where sacrifices were carried out. Recent excavations at the site of the temple have revealed one such rack and 35 skulls have been recovered from it. Over the centuries, there have been attempts to pass certain crystal skulls as having originated from the Aztec culture but these have been found to be forgeries by archaeological experts.